If you can obtain a drawing or an actual part, I will research the cost and time for billet propeller. Charles, I have a spare propeller. If you want, I could arrange to have it shipped to you. Let me know what you think. Thanks, David J. 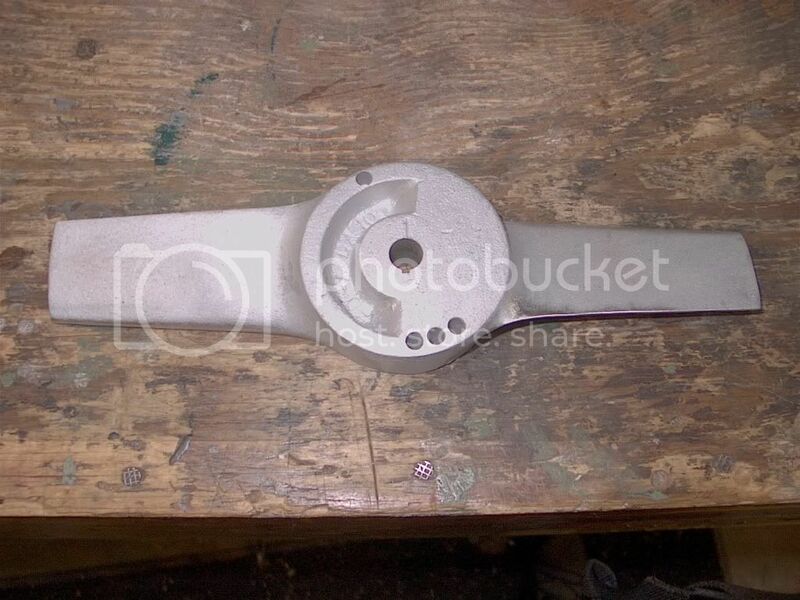 As well I have one of the "three piece" props where its got a hub then two separate blades. 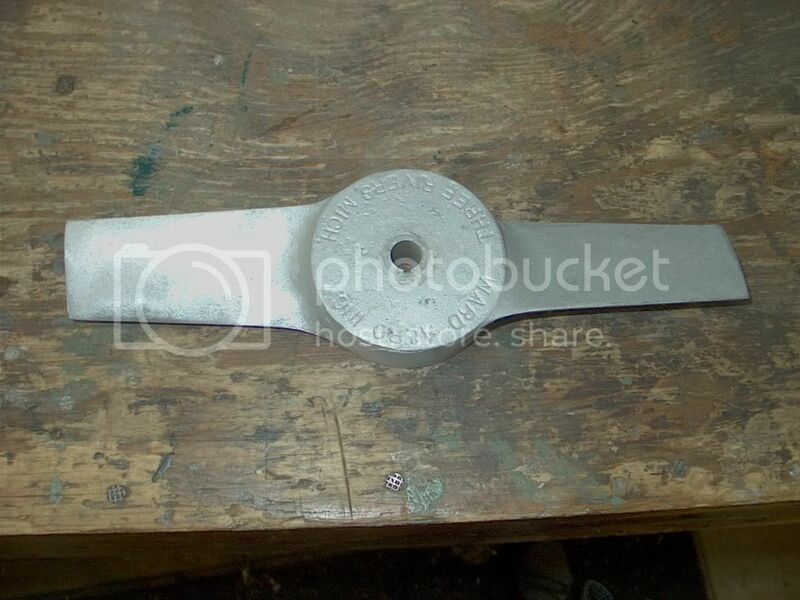 One of my blades is broken but if we can reverse engineer them we can make all we need. Let me know if you want to try this one as well. Looks like the generator is a Johnson/Evinrude Part #378160. There is a new one on ebay now. Parts still look available. I am taking mine to a nearby rebuild shop. I can now tell them what it is from! David J. Years ago I picked up some blades, but haven't seen them in years. If I run across them I'll send you a set. If I remember right, when you have adjustable blades you need to have a prop brake on the generator. Thanks much and need to dig them out myself. BTW, how are you feeling? Really sorry that you could not make Middletown. It was one of the best get togethers we have had in years. How far are you from the "Wings of History" museum? I may be taking a load of wooden props over to Guy next week sometime. After I got to the "three props to overhaul" point it became easier to drive them from Phoenix than ship! It's been a slow process. I'm trying to get back to work today but the doctors can't agree on it. I begged my doc to let me go to Middletown but she wouldn't budge. Maybe I'll have something cool to fly to Middletown in 2012. I do some work for the museum and they are only about 2 miles from the house. Give me the dates you will be in town and we can hook up. Anyone know what the cast cutout on the left side is for? Looks to me like the prop would not balance this way. Don't know to leave it that way or not. The drilled holes appear to be balancing holes. Thanks, David J. Is the other side solid? Agree that the drill holes appear to be balance holes, but who-ever made this prop put the "half moon cutout" there for a reason. Wonder if it was just to save weight? Joe, here is the front side. Charles (Seaheli) will have a prop in a couple of days. He is checking on a billet replacement. I can't figure the reason for the cut out. A little slow I guess....David J. That is something I had not thought about. Very good idea. Thanks! David J. Classic Aero at 480-650-0883 has a complete Ward Aero manual available for $20. Also have about 6-8 of the later isolation style generator mounting brackets available for sale. If some one makes props we would take a couple. Thanks Doug, I will be ordering one as soon as you folks open up out west. I have not heard from the billet propeller project yet. David J. Looks like the new prop project is a bust. Charles(seaheli) did everything he could. Was going to be at least $300.00 per prop. Looks like I will be keeping an eye on all the swap meets for a backup or two. Many Thanks again Charles. You have an incredible can-do attitude on all this airplane stuff! FYI, I have already warned him the Georgia Boys may make a detour over his way and repossess him on the way to Middletown 2012. I think he would enjoy himself, and we would all like to meet him in person. David J.